Mister Adam Turman, one of Minneapolis's brightest "art stars" came out with another great piece that local bloggers have been trying to decipher for a few days now. Why? 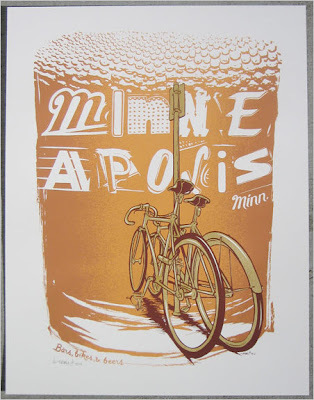 Turman cleverly spelled Minneapolis in his“Bars, Bikes, & Beers” piece by using letters from various local bar/restaurant signs. Sharp eyed bloggers recognized First Avenue, Mayslacks, Grumpy's, Triple Rock, etc, but nobody seems to know where the second letter "I" came from.